I couldn't be more excited that you are here, even though I'm kinda shocked how quick this week went by. I cannot wait for the halloween party this weekend. Be Kind to me Friday, we have a lot to do today!! I understand you're a Boxer and 7 months old....but your energy is crazy and mommy can't keep up with it. Also, why do you hate me? You are so lovey to everyone, especially Dad, but you constantly bark and are aggressive towards me. One more thing, can you stop terrorizing the dogs next door? Their little barks are annoying early in the morning. Thank You! Thank You for being the absolute BEST Husband in the whole world!! You put up with a lot this weekend between me not feeling well and my million anxiety attacks. I don't know how you do it sometimes. You seem to amaze me more and more every day when I didn't think it was possible for you to amaze me any more. I Love you! Thank You for allowing me to be in this constant state of Change here on M & M. I feel like the more I tweak things here on my Blog, the better my little ol' Blog is getting. And it's all because you allow me to make adjustments and be myself. I truly Love my Blog Family. Comment Down Below on what you'd like to see in the near future!! It's been a slow process but you're getting there. It's okay that it's been a slow process because this journey isn't about being "Skinny" or looking better then anyone...It's about being the healthiest and happiest you can be. You're doing great, Body! Keep doing work! Can you happen like.....4 months ago? Because really I NEED to move. We need our own space and I don't want to be stressed out anymore because of our current situation. We have everything boxed up so all we need to do is move. Please happen before the holidays come around and things get busy! I'd also like to be settled into our place by the holidays so I can decorate the house, everything is in boxes right now so I wouldn't be able to decorate where we are! Thank You! I'm sorry for how annoying and whiney I've probably been this week. You're pretty Rad for putting up with me and all of my "WHY'S." It's been really nice though cuddling up next to you every day for a few hours as I read your word and we have some nice chit-chats. It's really helped ease my anxiety. Why are you so temperamental when it comes to my Beauty Instagram? You post just fine when I'm on my personal Insta but the second I post a makeup look on @ashleefelkner you decide to freak out and say "posting" for about 2 hours straight. Please get it together! Thank You! I haven't been able to watch you live in action but everything is taped so far...I promise to spend all Sunday on the couch with my husband watching spooky movies. I would like to remind you that it's now the last week of October and you've only dropped below 72 maybe twice. Can you please get it together and be cold, overcast, and rainy? Thank You! Where the Heck did you go?? Happy Friday Everyone - Did you write a Friday Letter? 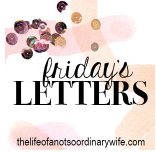 Go Link Up at "Life of a Not so Ordinary Wife" and Join Melissa in her Friday Letters! 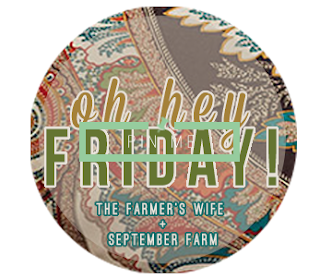 Also go Link UP and Join Karli at her "Oh Hey Friday" Link Up! Hope you have fun at the Halloween party! Thanks for linking up this week!! I feel ya on the weather, up here in northern ca it's the same "not cold enough" fall weather! October has definitely flown by!! I hope you get settled in a new place before the holidays. We are moving in December and I hate moving during the holidays. I just want to be in there and settled! We are hoping we get settled in before the holidays too. I want to be able to decorate and just relax and enjoy my favorite time of year. Our current home is in boxes and I am itching to just move them and unpack them haha. I hope your move goes smoothly and you'll be settled in time to relax and enjoy what's left of the holiday season!